At 1.45pm on Friday 13th, I was standing on the Castle lawns in the shade of a cedar tree watching some cars leave Highclere after a press event here. 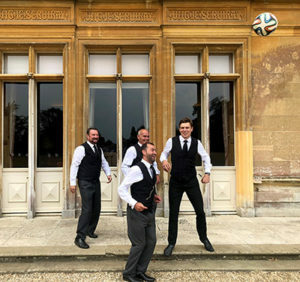 Luis and his banqueting teams were in waistcoats (of course), they had been practising heading a football whilst I was throwing it in, only slightly worried about the Library windows – see my previous blog for more photos! We then began to carry plates of food back from the picnic to the office as I can’t bear to waste food and the meats and salads were utterly delicious. Bella the Labrador was helping. My first comment was, in fact, ‘champagne’ so James H was dispatched to the Castle fridges and retrieved two bottles both to celebrate and to sustain our afternoon. Maggie produced some very classy blue plastic cups. Lots of our team miraculously appeared, the champagne evaporated, tea intervened before we moved on to Prosecco. There were now more (small) bottles and fewer people so it was all going rather well. 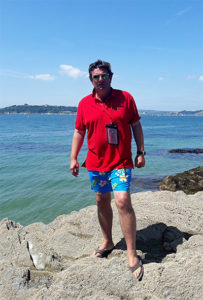 Justine had just commented to me how fantastic it was to work with a young, bright Oxford law graduate (young Robert) whereupon he found himself replying to his own comments on Facebook, which was without doubt a Prosecco moment and led to more laughter. Thank you for sharing so much of Highclere and Downton Abbey. I appreciate it. Thank you again. I love your classy blue champagne glasses. If the Downton movie crew begins filming in September do you know how many months they will be on site filming? Most films I believe take circa three months.. So happy for all of you! Funny; I had contacted your office in May asking about the October calendar, as I am flying from Boston for the royal wedding. I had wanted to visit Highclere, but the schedule wasn’t out yet and I was trying to sort out my flights. Julia had said that there “were no firm plans yet”. Now I know why, there must have been a lot going on behind the scenes to sort out! Luckily my flight plans work out perfectly with the Special Guided Tour on October 13, and I have already secured the tickets! I cannot wait to see your beautiful home! Where did you find Oct dates? I am coming the 19th through 30th and would love to visit. I’m so happy to hear this good news and will look forward to seeing more of Highclere in the Downton movie! It will be amazing and surreal for us! The news about the movie is wonderful and I am glad for the impromptu party that the good news occasioned. 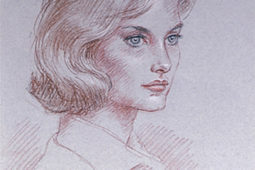 Your writing is delightful and I have enjoyed the opportunity to learn about the history of Highclere through you blog. The picture of Bella at the top of the post is reminiscent of the opening credits of Downton Abbey. I hope Bella was able to enjoy a few healthy treats to celebrate too. Awesome, I can’t wait to read your next blog and the ones after that. Having been to Highclere they bring back many good memories. Thank you for sharing. 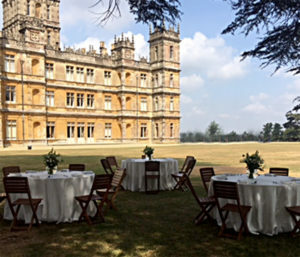 The Downton Abbey movie is surely something for everyone at Highclere to celebrate. It sounds like you had quite a party! You also may want to save those blue plastic cups. They do sound so classy and you never know who you may have to entertain!! (laughing) I am so happy about the movie myself, I’ll have to see if I can dig out some plastic cups for an impromptu celebration!! As Carson the butler put it so well “When you are tired of style, you are tired of life!!! I love serendipity don’t you, Lady Carnarvon. It underscores when things are meant to be. Downton and Highclere are now inextricably intertwined, and we (your adoring readers and Downton devotees) couldn’t be more pleased. I suspect there was champagne popping across the globe with this news. Of course, when the castle doors closed with Downton’s last episode, I’d heard wonderful rumors that maybe there would be a movie. I couldn’t quite imagine how that would happen, because movies are contained stories, and how would the producers catch up viewers who had never seen the series (of several years) in such a way that it would all make sense? And then, frankly, I didn’t care, because I knew the devotees would understand the plot and its continuance. So I can’t wait to see it. I’m dusting off our Downton china and cutlery, and polishing the crystal. We will be ready with a royal Downton dinner to beat them all that we held here at our home. We will be ready for this resurrection kind of movie. (And wouldn’t it be lovely if they would resurrect Matthew?! 🙂 ). Downton was more than Downton, as no doubt you, your husband, and that joyous, champagne-popping staff of yours discovered. Downton is beauty, imagination, creativity, hope, and a bringing together of many cultures and new friends across the globe. (And even here in Saint Louis, it gave us personally a wonderful reason to gather family, friends, and some new friends each week around the dinner table and widescreen TV). Downton, I daresay, was the genesis of your incredible blog and put Highclere on the global map. You already had a wonderful platform and the means of reaching out, Lady Carnarvon, with your charitable heart. But Downton extended your platform and your reach far beyond borders perhaps than even you could have imagined. I can’t thank you enough for having caught a breathtaking vision, and a way to do such mammoth mounds of good in our world. I can’t thank you enough for being so generous as to open your very own home to friends and strangers near and far. You are a kind and gracious lady, and you truly are making a profound difference for your fellow man. I’d say you are pretty much of a hero yourself. You are definitely toooo kind!!!! Love the photo of Bella; it reminds me of the opening shot of Downton Abbey that I looked forward to every week. 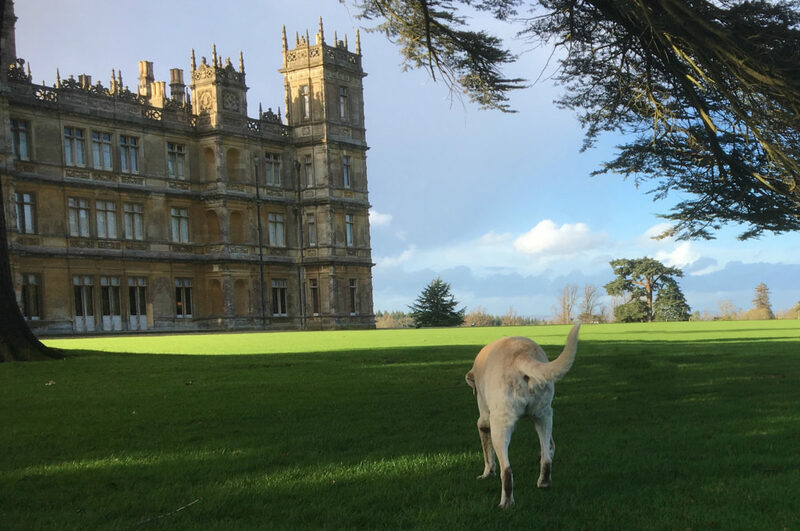 Golden labs are, now, synonymous with Downton and Highclere. Enjoy having your other “family” back with you! Just shared your news on FB! love love love ‘Downton Abbey’ cannot wait for the movie. I visited ‘ Highclere ‘ from Australia last July, it was on my bucket list, but the clouds decided to opened up on the day I was visiting and bucketed rain.. I would so love to be sitting in your beautiful garden and be able to watch the movie being filmed, how beautiful all the outfits are. You are one lucky lady and I do wish for you ,that you will hopefully get to meet the amazing cast .. I loved reading this glimpse behind the scenes for such a moment! The film made me smile. Thanks to your eloquent blogs, the cast and characters of the real Highclere are even more interesting to me now than those of Downton. Wouldn’t it be funny if, one day, there was a series created about these times right now at Highclere! This is great news..so excited for the movie and congratulations on this adventure. I wish I was there to help..you know just to carry a cup or hold an umbrella…or sweep I’d do it. Isn’t it rather lovely how it brings people together? This is fantastic news! No wonder you are beside yourselves with excitement. Can’t wait to hear more. 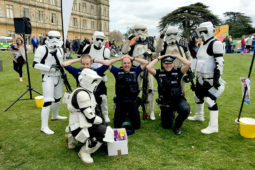 I attended the Heroes at Highclere event in 2014. And the Battle Proms the next day was brilliant. So wish I could come again. Best wishes for all you do there to serve, educate and entertain. Six seasons of Downton Abbey and now a movie. The series episodes are firmly imprinted in my brain. Great news. Also, so many current serious world issues to be sorted out. What a flurry of activity and fun! Thank you for sharing the real Highclere and its wonderful cast of characters with us. I celebrated the news by sharing your post on social media. What is the release date? Today I’m raising my virtual classy blue cup filled with you all. Congrats and cheers! What a flurry of activity and fun! Thank you for sharing Highclere and its wonderful cast of characters with us. I celebrated the news by sharing your post on social media. What is the release date? Today I am raising my virtual classy blue cup with you all. Congrats and cheers! Great news, if Mrs Patmore needs an assistant I’ll polish up me Yorkshire accent. Being a former Linconshire lass it won’t be too difficult. I love your enthusiasm. Congratulations. I read your book about Lady Almina and it was eye-opening. It opened a window into the societal structure of England during that time, the importance of noble families and philanthropy, and was inspiring since Almina’s birth could have been her downfall if not for her doting father. I just loved it and look forward to visiting Highclere next time I visit the UK. My family also has an interesting background and colorful people that made an impact historically. Thank you for putting forth the time to write your books! I really enjoy writing – it is a great story, I always read the letters from the patients and family and they make me cry. Oh my…where to begin? To say I am excited is a vast understatement. I immediately posted the notification on my Facebook page. I will re post as more information is revealed. I think when we go to view the movie I shall dress in formal attire! I may even wear my 55 year old tiara saved from my days of childhood dress up play. A celebration indeed. 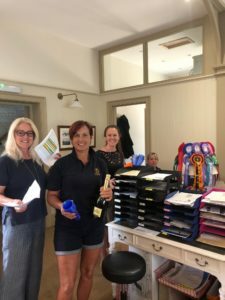 I can only imagine the sense of excitement stirring in the Highclere office! When a celebration is in order, one must use whatever you can find, and the blue cups worked! I love it. Now I will go to the web site to see what the schedule is for Highclere. Thank you again for keeping us updated. I think for those of us who are confirmed Downton Fans it makes us feel like we are a part of it, even if it is only in our imagination. God Bless you, Lady Carnarvon! I chose the Heroes weekend for good reason.. a good weekend for fund raising..
Dear Lady C I am so excited over the movie. I hope that you have a cameo spot in the movie but I want it to be secret to those only that participate in this blog — won’t that be fun for all of us to look for you and to have this little secret? ? Since filming won’t start until October and goes around three months perhaps their will be a snow scene — like the one with Matthew proposing to Mary with the snow falling (be still my romantic heart– oh my I am such a dreamer!). Thank you for sharing your home with all of us. More sequels to come I pray!!! So so fun to read. We are so excited!! So loved our time at the castle couple weeks ago and can only imagine the excitement of knowing that all those characters are going to come alive again and such a beautiful setting. Absolutely excited. Can’t wait and I am so glad you are able to do this and allow them traipsing all of the place, but I guess it is wonderful that you will be able to use funds to help with the upkeep of Highclere. It is such a beautiful place and the grounds amazing – a true honour to have been able to visit last August. CHAMPAGNE, CHAMPAGNE, CHAMPAGNE, TEARS, DELIGHTED. I am so excited in hearing this news. Huge fan of The Carnarvon family and of course Downton Abbey. I am from England and live in Austin, Texas. I was so excited to be coming to Highclere on Aug 24. Unfortunately it says on the Highclere website, that the Castle is closed that day. Maybe next time I visit England. I was so looking forward to visiting Highclere. I am quite sad. We are open the day before – Thursday. We close Friday and Saturday to give the team here a chance to rest as it is long hours in the summer. Friday is our office day and the chefs are in every Saturday to prepare for Sunday and the week ahead. There is a rhythm and a reason and we try to keep the same plan each summer to help you plan! Amy and I are thrilled – totally thrilled! Cannot wait to hear the reports when you are with us in Feburary ’19. Great news !! The whole world was waiting for Downton Abbey to continue !!!!! More champagne please !!!!!!! Highclere Castle is becoming more famous than Buckingham Palace !!!!! This is very exciting news indeed! So happy for all of you,and us too! Giving me something to look forward to! Congratulations ! I am sure whatever profit there is for the dear old house it will be spent on boring things like roofs and damp rot…but I give thanks that at least one old house will be preserved. I remember the awful days when a beautiful house fell to the wrecking ball every week, I still mourn them. You work very hard to host events and hopefully the movie will be worth while..at least it will be fun! I hope that one day my friends in France will find a sympathetic writer and film maker too. 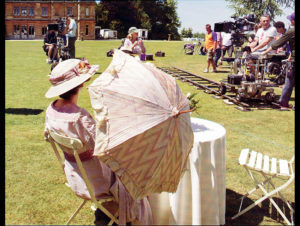 So excited for the movie and to see scenes of Highclere Castle. My husband and I will be visiting for Hero’s of Highclere in September on our vacation to England. What a privilege to be a part of this occasion. I so Enjoy your blog and keeping us up to date about everything Highclere. Delighted to hear you are coming – now, what are you wearing??? What wonderful news! You and all your team must be thrilled and excited. Your home is such a beautiful place. I have now visited twice and will come again as I see something new each time. Thank you for all the charitable work you do. It would be nice for you (if you have time in your very busy calendar!) to put on another talk as you did in the church a couple of years ago for charity. I thoroughly enjoyed every second of it! I will do that later this Autumn – just sussing schedules! 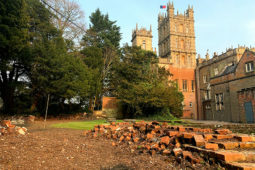 Downton-“here-we-go-again” is coming back to Highclere! What fantastic news that they are finally getting the ball-rolling, er, lights, camera, action, and doing the film! Surely it will make it to the Academy Awards, and pick up a few Oscars? Is there an Oscar for “Bestest Ever Location”? Highclere Castle should definitely get an Oscar, even as “Best Supporting Edifice”! Thank you for posting the good news, and much applause to you and all your staff as you work to cope with film cast and crew. Enjoy the champagne! That era is so romantic – can’t wait to see the movie. I am thrilled about the movie. In 2016 we visited the castle and have purchased all 6 seasons of Downton Abbey. I am almost finished reading your novel about Almina and love it. Also enjoy your blogs. My grandfather was born in Mark, England, and I can’t get enough of anything English. Thank you for sharing your beautiful castle with the world. get enough of anything Welsh and English. Blessed be! The film is very good news, I’m sure you are delighted to have Highclere featured once again! Can’t wait to see if it will be a continuation of the saga….or will perhaps include additional stories from the Crawley’s past. It will be so interesting to see the arc of the film! Incredible. It is hard to articulate how excited we were to check into London Lodge for our 25th Anniversary Celebration about three hours after this phone call came in! The smiles on Paul (the chauffeur) and Matthew’s faces told us how excited the staff was, which carried over all weekend, including Sam, Sheena and Bob. And for you, Lady Carnarvon, to join us for afternoon tea on Sunday was a wonderful gift that we will never forget. We look forward to supporting your endeavors however possible! Thank you Bob and Kelly – it was a good cup of tea! Yes yes yes, great news! I am so happy, as so many of your followers and DA fans. I have the dvd collection of DA and am saving to watch them when grey, dark, windy autumn arrives here in Finland. Tea, biscuits & Downton Abbey – oh yes! Hardly can wait, but I will. I shared this news to my Facebook followers as many of them love DA too. Fabulous! We are celebrating with you and we can’t wait! Busy days ahead! I look forward to see more of Highclere, your amazing home; in Downton. How very wonderful! Mother and I are raising our glasses to the Highclere staff and the Downton cast – sharing in the excitement!! (But we don’t clink our glasses – Lady Mary would never do that…) Ha! So excited!!! Please keep us posted on everything and take pictures!!! Thanks for sharing the news Lady Carnarvon!